1. 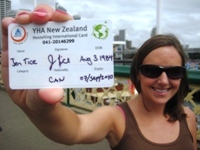 YHA/Backpacker cards – these can be purchased at most tourist information booths in Australia or New Zealand. For the cost of $40, you get one night free accommodations in a YHA hostel, and 10-20% off most tourist attractions. It pays for itself within a few uses. 2. Hostels – there are a few ways to save money at hostels. Before you book, ring a few up to see if they have any jobs available in the hostel. Lots of places, especially during busy season, offer free or reduced cost stay for help cleaning the hostel. Many hostels also have weekly discounted rates if you’re planning on staying in the area for a while. 3. Markets – looking for a new funky shirt, souvenirs or jewelery at a cheap price? Find your local market. In Sydney, Paddy’s Market has two locations and offers a ton of cheap souvenirs and fresh produce. Melbourne’s Victoria market offers much of the same. 4. Local transit – find out the scoop on local transit as soon as you arrive in a new destination. Many cities offer discounts for purchasing tickets in bulk or all day passes if you are planning on covering a lot of the city in one day. 5. Getting to and away from – depending on how you want to do your travelling check out these sites to save money. http://www.standbyrelocs.com/ If camper van is your style, this site offers cheap if not free rentals for taking the van from one city to the next. Perfect if you are moving up or down the east coast. If flying is more your pace, checkout http://iwantthatflight.com.au/ for a comparison of all the discount local airlines. Being flexible on dates for both flying and driving is key to getting the best deal.